As more screens become embedded into our physical spaces such as airports, train stations and communal areas, there is an opportunity for the movie to take pause and through sensors respond to its environment. Yet schedulers are stuffing the big screens with old content, movies designed for TV and cinemas. Adverts tightly cut into 30 second slots are screened repeatedly into a space where they have all day, they could take their time. How would you create a moving poster? Would it be a generative animation that leisurely scrolled though a database of movements or would you use sensors to attract attention? How would you design an animation that was shown continuously 24/7? This is a research project to investigate how you would develop your message into an interactive poster or generative animation. Your animation will be installed on a 800px x 480px screen that can use sensors to interact with passers-by, therefore you will need to ensure that the images for your animation are 800 px by 480 px. The animation could be pressed by the passer-by to view more information or it could have a heartrate monitor that measures a by-stander’s pulse and changes accordingly. The heart rate monitor could be used to measure the inflammatory nature of your poster. It could also have a lie detector attached to the poster to check if the bystander is answering truthfully. Or the advert could respond to external data sources such as weather or like the BA adverts it could track the movements of flight paths. Part of the research for this project will be to understand the different sensors and how they could be developed for promotional material. How would sensors enable you to communicate your message? Alternatively, you could create a generative poster, an animation that cycles through its own database of actions similar to the idling actions of character in a video game waiting for something to happen. How could a poster cycle through a series of actions? How would an animated poster work in a public space where a the viewer’s attention wanders around the environment? Rather than promoting a product your poster has to promote an idea related to the theme of Global Issues and the narrative you have been working on, it must be a piece of propaganda that uses movement to expand on its message. How would sensors expand on the message? 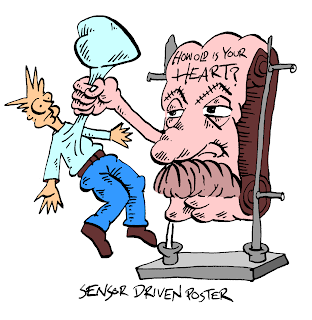 How would sensors encourage people to think a certain way? Unlike posters which have centuries of tradition, interactive and animated posters are relatively new and there is an opportunity to forge new ways of disseminating information. Research ways that your message can be enhanced through interactivity, what sensors could be used and how will they enable viewers/users understand your message to more effectively. Although we have set the format of the poster we want you to produce there is still plenty of scope for you to be creative when thinking about your proposal. 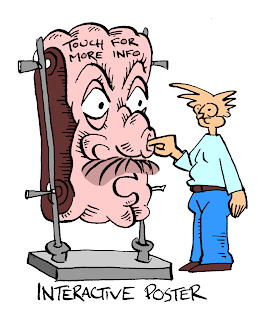 Will your poster be serious, absurd, informative, scary, dramatic, scientific, realistic? What are the important messages related to your chosen subject area? Who is your target audience and how will you make your poster appeal to them? Where could your poster be displayed? How will you incorporate your theme and communicate your ideas? Which artists can you look at for inspiration? Now is your chance to choose a new VRQ specific to the contexts of your poster. Choose something that helps you to explore the direction you want your poster to proceed in. Think about context! For instance, you might be interested in other artists who have tackled global issues in their work. Or how different artists use a variety of interactive approaches in their work. You could research into how the potential for interactive art may change how we view the world in the next decades. It’s up to you. Interactive poster Workshop (optional) For students who want to further develop an interactive or generative poster. If you choose to create an interactive poster for ILLUS500 your final animations must be 800px x 480px with a storyboard indicating how they are used, these will be uploaded to the DLE. For the working poster your animations will be installed on a Raspberry Pi. 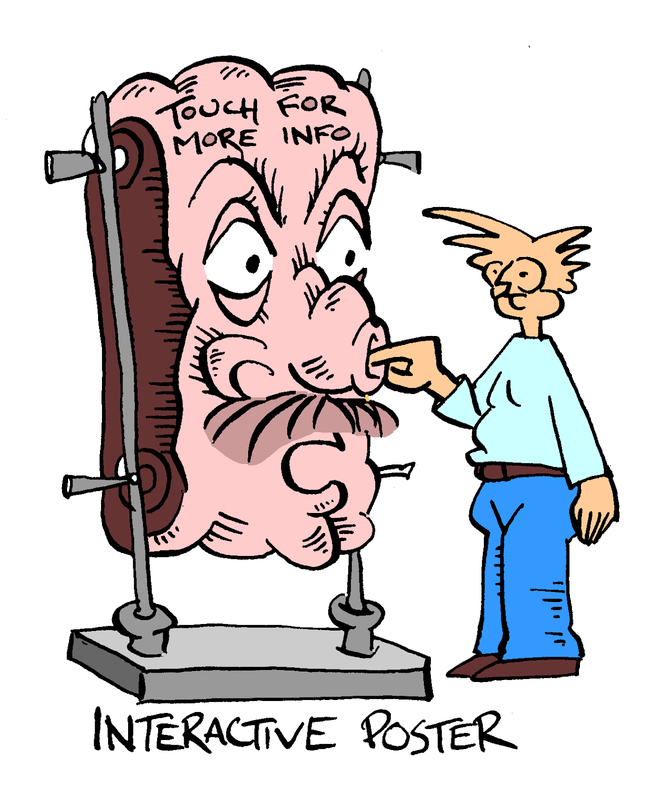 So, what is an interactive poster?